The magazine piece that I do want my photos to be as large as poss (I use 4608x3456 on the camera). They can always reduce them, but cannot enlarge with quality if too small. It does mean that emailling them is a pain, with a 10mb limit per mail, sometimes I can only send two and a bit of text. To be honest, I thought I'd shrank all my images, and this is one likely to be published one day. I've since learned that publishers don't like shrunken images. Weeks of Maidstone rebuilt loads of watermills in Kent and nameplates can be found in lots of places, particularly on waterwheels. They initially started out as millwrights in the 1850s and were in partnership with another millwright named Petman in the 1850s. The last reference I have to them is from 1924, when they must have been forced to shift away from millwork, due to lack of business. 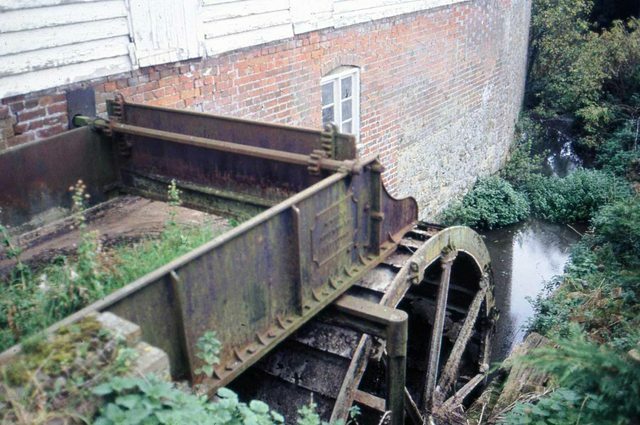 Here is one of the waterwheels with a nameplate at Chegworth Mill, Ulcombe. The late Brian "Smudger" Smith had a larger Living van . It is still parked by his house at Danaway on the left of 249 .Also there are his swan neck transporter and (some times ) his Engine, which he bequeathed to his Grandson. I seem to remember that Fred Dibnah had something very similar to this that he used to tow behind his Aveling and Porter. Nice to see you here. Van looks great. Welcome to the Forum. Congratulations on your acquisition, looks a good project. If you put w weeks and son maidstone in Google search box, there is a wealth of info on line for you to sort out. Good Luck . I am new to this forum, recommended to it by "Dave the Train"
I know a very little about the company, as on a friends farm there is a "weeks water pump" but other than that I am ignorant! Does anyone have further information on the company, and when they were trading etc. Likewise are there any catalogues for the company which feature "living vans" - I would love to see a picture of how this would have looked when new, and likewise to try and date it. Thanks for your help, hope this is of interest.